NEW IN 2018: available in MOA. The new MOA SCR reticle, with 1/4 MOA click values. a Steiner exclusive that shows each mil or elevation through the indicator window on the elevation turret. After the first 120 clicks (MIL), the numbers on the scale change automatically preventing the shooter from getting lost on the dial. T5Xi 5-25X56 is rated 4.8 out of 5 by 458. Rated 5 out of 5 by Qoo308 from AWESOME OPTIC This is my second T5Xi 5-25x56, purchased the first one and just love the sharpness of image, it is outstanding and super clear. I have been using Nightforce, Leupold, Zeiss and recently played with my friend's T5Xi and just loving it, so place the order for the first one to go on my Savage 10TR bolt action and could not stop myself to buy another one to put it on my long range shooting AR. The target turrets are very low profile and user friendly, the reticle is some fine and easy to read. Overall, i am very please with the quality of the scope, will definitely spend some time on the range and see how well this scope can do. Rated 5 out of 5 by Aphelion314 from Amazing optics I drove 9 hours just to take a peek. I had been in the market for some time for a scope that I can shoot ELR and also hunt in the harsh deserts and mountains of New Mexico. I had been in the market for a scope that I can use for both purposes. I am not made of money and wanted a one and done scope that I can use for many years to come. The optics and reticle were far superior to my fathers night force and razor HD. The price point was also better than I expected. All of the reviews I had read were right. Steiner is an amazing company with a warranty as good as the other companies well above what I paid. American made and top notch service. Rated 5 out of 5 by roboto1138 from Incredible Value, Excellent Rifke Scope I have been waiting for the release of the T5Xi for quite sometime. Having had the opportunity to use the M series scopes on friends rifles previously let me know that this new version would be worth the wait. I am replacing my Bushnell HDMR G2 on my long range precision rifle. The Bushnell has served me well, but the T5Xi offers additional features at a price point only slightly higher. It also offers superior optical quality only matched by the other "German" players at a fraction of the cost. The ease of use of the zero stop system is awesome. The tactile clicks of the turrets, illumination, and solid construction is found on scopes costing several thousands of dollars more. Rated 5 out of 5 by sparkie2413 from Awesom long range scope I was one of the first in the USA to obtain this great scope. I mounted it in seekins rings on my brand new RBros custom built 338 lapua magnum rifle. 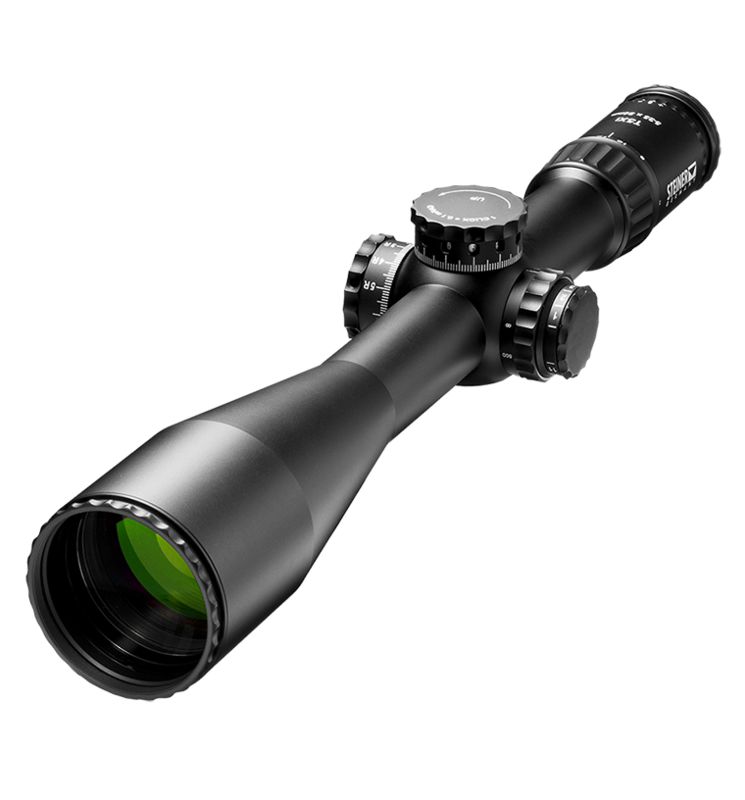 This scope has all the features offered by much higher S&B scopes at a substantially reduced price. I think there is no better scope for ELR shooting/hunting for my application out there. The clarity of the glass and repeatability of the turrets has proven to be spot on, exactly what I expected from Steiner. The new SCR reticle suits my applications perfectly. I am very satisfied with this purchase and recommend it to others without question. Believe me, you will not be disappointed in this high end optic! Rated 4 out of 5 by Captramrod01 from Unbeatable value at this price point. This is my 4th Steiner optic. Turrets, scr ret, resistance of parallax knob and magnification ring are all 100% spot on. One thing about this scope is the diopter adjustments are very sensitive and can take some time to fine tune the adjustments. If you take the time to fine tune I'm confident you will eliminate any CA you may be seeing. Other possible downside is the parallax markings are off by a significant amount on my scope. Not a deal breaker for me as I've used scopes before that don't have markings at all. Overall I think I will really enjoy this optic and if all goes well in my further testing of it I will be buying another one for my 300wm. Rated 3 out of 5 by MBsnow from Love the turrets. Purchased this scope(5-25x56) through an online retailer. Was a little frustrated when I got the scope and the reticle was severely canted. Sent it back to Steiner and they shipped me out a new one, no questions asked within a week. Finally got the new scope mounted on my rifle and performed two separate tracking tests and I am very happy with how everything is performing. Absolutely love the turrets, and the quality of glass. Steiner seem to have had some quality control issues on the initial run of optics, but it seems they have ironed out the kinks and I would not hesitate to buy another Steiner. Would have given 5 stars if it wasn't for the issue with my first scope. Rated 5 out of 5 by Tallbino from Very impressed right out of the box I bought this product primarily to begin long-range precision shooting. My prior experience is in shorter ranges 1-300 yds. I have a few zeiss scopes, but nothing with this amount of magnification. Image quality is extremely crisp and sharp throughout the magnification range. Light gathering is incredible (as would be expected from a Steiner product). Build quality and finish are very good, and indicative of typical german engineering. I cannot wait to put some rounds downrange, and begin testing the limits of my shooting ability. Rated 5 out of 5 by rocdoc from Fantastic value! I bought this optic based on Steiner's reputation for rugged scopes with great German glass, as well as the incredibly reasonable price point. I have two Premier scopes and a Kahles. This scope has optics that are on par with my current scopes. The scope is built like a tank, yet at a fairly light weight. The turrets have a great feel to the clicks, like the Premier but better spacing. Unfortunately the turrets don't have MTC, which I have grown to like on my Premiers. Tracking on a tall target seems to be spot on. So far I am very pleased with this scope, and even more so given the price! T5xi 5-25x56 coming soon so what is the recommended mounting rings and top rail for a Savage T10 in .308. &nbsp; -how tall on the rings and what material should they be alum or steel? -as for the top rail, again alum or steel and what MOA should it be? The bell of the scope is 2.5&quot; across. subtract 1.25 by height of the base then add clearance at the bell about 1/8&quot; for zero MOA or 1/4&quot; for 20MOA. increase in MOA is obtained by angling the scope downward toward the muzzle (I believe it is 1/3 of a degree for 20 MOA).so if the base is .5&quot; rings should be roughly 1.15&quot; for 0MOA or 1.25&quot; for 20MOA base. Recommend steel base and aluminum rings Nightforce or Vortex make good rings. I'm considering purchasing the T5Xi 5-25x56mm SCR Reticle scope and mount it on a Tikka T3x TAC A1. I intend to shoot between 300 - 1500 yards. Have you any recommendations for a scope mount? I would make sure the mount has a minimum 20MOA cant if you plan on shooting out that far. As far as a company to recommend I don't have any specifics. Good Morning! The T5xi will come with flip up lens covers, a sunshade, and a throw lever. We appreciate your business! I currently have a gs3 scope and like it. Does the t5xi 5-25 have the same glass or should I expect better clarity and light gathering from this scope? Is it better glass or just more other features accounting for price? The T5 will be brighter and clearer because of the 34mm tube. The grade of glass is the same. I would do the high T-Series mount. What are the difference between the T5xi and the M5xi, also when they said that the M5xi is 100% sealed, what are you referring to? Is the glass different between these 2 models and are both models turret design create a 100% tracking reliability as well? The M series will feature a higher grade of premium hand picked German glass, and is built to withstand the rigors of military duty. I have a TX5i 5-25 x 56. I have 2 Ruger Precisions, .308 and 6.5 Creedmoor, and plan to swap the scope back and forth using QD rings. What height rings should I use? For the Ruger Precision I would recommend Extra High.